According to Digital Trends, Walmart has lowered the price of certain smartwatch models including the Apple Watch, the Samsung Galaxy Watch and the Fitbit Versa. If you haven't purchased yourself a holiday gift yet, or still have some names to cross out on your holiday gift list, you might want to check out these deals. And Walmart is even willing to throw in free two-day shipping! First up is the Apple Watch Series 3. The 42mm model, with an aluminum case and a sport band, is only $259. That is a $50, or 16% discount off the usual price of $309. 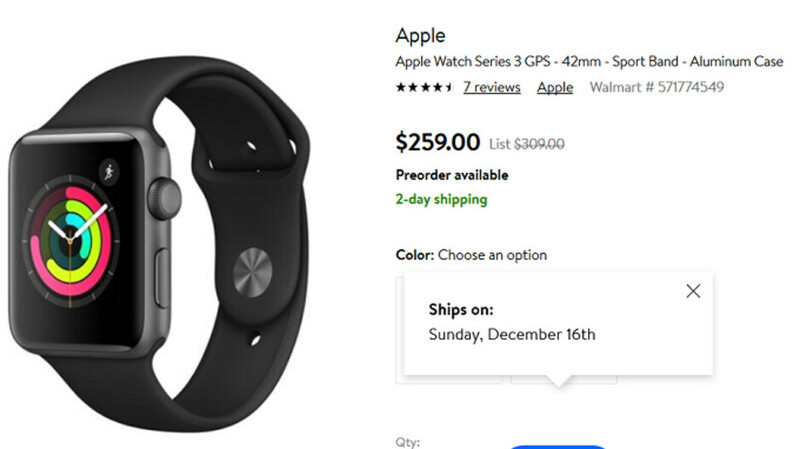 The watch ships tomorrow, December 16th, and is available in Silver/White and Space Gray/Black. This is the GPS model of the timepiece. If a round dial is more your style, Walmart has the 46mm Samsung Galaxy Watch in silver on sale for $297.99. That's a $51 or 15% drop from the usual $349.99 price. This is the Bluetooth/Wi-Fi version of the timepiece. The 42mm Samsung Galaxy Watch in Midnight Black, also the Bluetooth/Wi-Fi variant, is on sale for $277.99. This is a $50 or 15% discount. And if you're looking for a better deal, the Fitbit Versa smartwatch can be purchased from Walmart for $148.96. This is a $50.04 or 25% discount from the usual $199 price. And the Versa has many of the same features that you'll find on the Apple Watch and Samsung Galaxy Watch.